Reflections on the final assignment 5 What to do? I particularly enjoyed the landscape and outdoor drawing (part 3) probably because the nice weather allowed me to sit outside and I looked at and emulated a variety of artists. I discovered Oriental drawing and have found much of the work I like is emanating from the hand of artists of modern Oriental origin such as Ryoko Aoki ref:and Nobuya Hoki ref: https://bemilne.wordpress.com/category/coursework/part-three-drawing-outdoors/ both of whom use delicate line in their production of images. I have discovered this again in the work of Friedrich Kunath in the new Vitamin D2 New Perspectives in drawing book. Townscapes were less successful. I am unhappy with people around, feeling I need to draw more quickly. 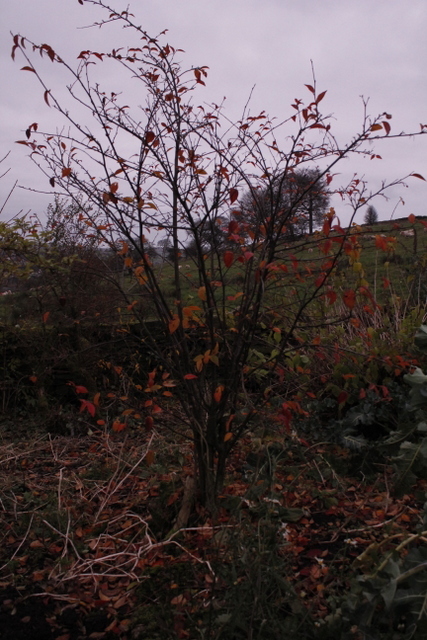 Also, the duller colours and less interesting forms compared to nature are less inspiring. Lowry is good but I have never been completely inspired by his dull grim images, liking them only because of their relative humour and their depiction of home in the North West. Hence, I have decided to concentrate on Part Two Observation in Nature and see what I can do with simple winter plants, particularly seed pods and crumpled leaves. I did not like drawing animals. They move too much and they have little colour compared to fruit and flowers . Also, depicting character through image is certainly not (as yet) a forte but it is something I need to work on. This was equally so with section 4, “drawing the figure” I like the curves of the figure and perhaps should have attacked the images with more colour and varying marks to produce greater inspiration. I enjoy sketching little thumbnails of people whilst sitting in cafes or stations but I can’t see these ever developing into larger pictures except as part of colour based socially descriptive “scapes” of my local surroundings. Capturing thoughts and character, I feel are something on which I should work. Self portraits gave greater option to look at other artists in a more private environment and so develop ideas a little more, but I was still not as enthused as much as by nature, partly because the image is so “enclosed” an entity and it is so difficult to get a likeness as the human brain is so atuned to the minor nuances of the figure and face. This is an area I do need to practice. Although I feel I am not “good” at composition, I have always been fond of the ASKEW, the IRREGULAR in composition . I would like to venture into the final assignment from the aspect of nature, to research more artists in this area and to use the dry and discoloured plants of winter. During an early morning walk, I took some pictures, the sun had a pinkish wintry hue, the red winter trees were glowing in this light.trying to capture( by manual control of the camera settings), the colours, the soft warmness and the silence of this morning, but it was too dark to see with a camera what the eye could see. Of note the light histogram of the photo showed graphical grouping at the very light and the very dark polar ends of the spectrum. I know I often draw this deep contrast in tones e.g black against bright colour and am obviously attracted to contrasts. 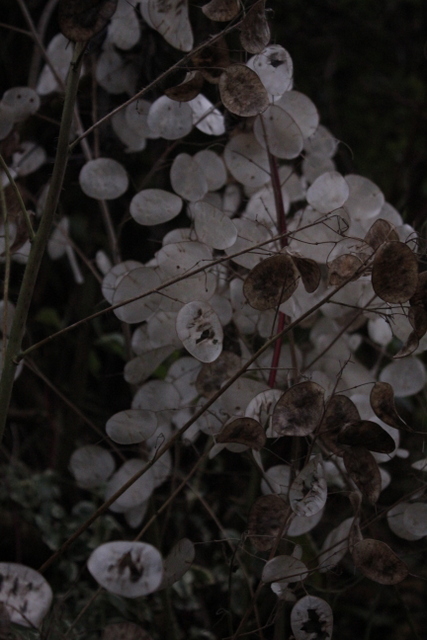 What struck me most that in this pink glow were the seed pods of the Honesty flower (the siliculae) .They were shinning silvery white, nestling under the trees .I have used these plants before for two winter pictures, one in collage and one in oil. I seem to have a fascination for their frailty, their shiny white ,silver grey irregular colour, their crispiness , their beautiful flat and rounded shapes and the manner in which they are collected in crowded irreguklar groups on the stems. Could I reproduce the colours of this morning and the peaceful warm feel? 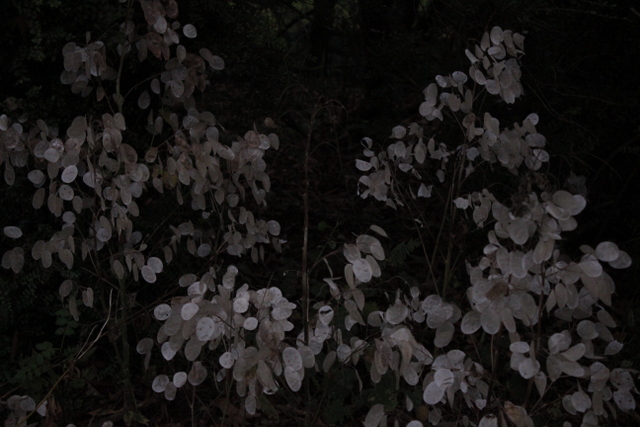 The honesty seeds remind me of the delicacy of lace and the soft shininess of silk or velvet. I have decided that because of my love of lace and delicate patterns I should look at lace to help with the final drawing of these honesty seeds. I also remember that one of my pictures of the seed pods in the past highlighted the presence of two seeds beneath the silvery tissue membrane of the pod and reminded me of foetal twins nestled in the uterus protected from the outside and wondered if I could bring in the medical world to the final drawing or at least a feeling of the development of new life. What is the best way to depict something so delicate as portrayed by the frailty of the seed pod and by the implication of new life emerging from the dark and relatively lifeless protection of the womb? Perhaps the seeds are delicate and the pod stronger in its protection than it appears. How could I depict these life protecting pods? What media would satisfy the feel of silence, delicacy —fine, hard pencil, fine pen and ink, coloured pencils -perhaps some chalks or conte? What colour the paper? White or tinted pink–too twee? Could I incorporate the use of silver on pen? How could I produce a feeling of life protected -with a hint into human life?Or does this route seem too descriptive. What about the background of leaves being made up of images of hands of children like the prehistoric drawings? would that be too “tacky”? Perhaps I should stay in the realm of delicate pattern and colour. I love the way she has used small insects in multiple images to produce a delicate pattern which is more artistic than biological . Her images are very light and delicate with minimal delicate colouring. I note in some of her images she uses silver ink (which is an idea I had had in the drawing of the very silky seed pods) as well as light graphite, black ink and watercolour.